…Plus two bonus guitar gift ideas! 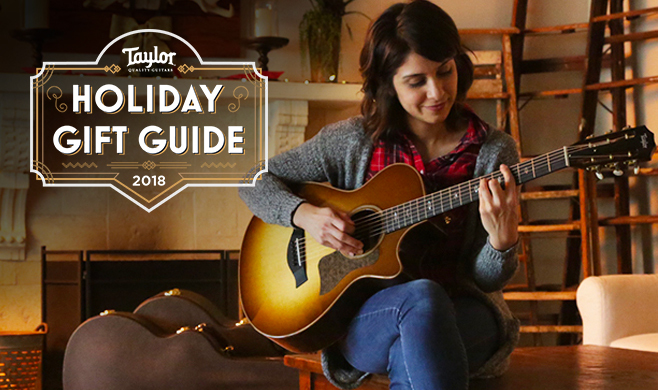 It’s that time of year again: colder weather, warm drinks, maybe a cozy fireplace—and hopefully, a new guitar to bring music to your holidays. If you’re planning on giving a guitar as a gift, it’s always a good idea to add a couple of essentials to make sure whoever receives the guitar can play it right out of the box. 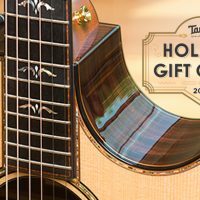 If you’re just looking for guitar gift ideas for stocking stuffers, we’ve got you covered there, too—from tuners to extra strings and picks, there are countless ways to bring the Taylor spirit into your holiday season. 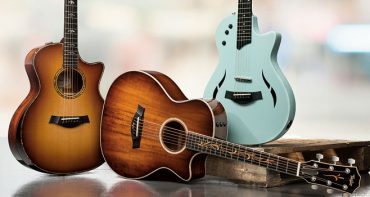 Still deciding which guitar to buy? 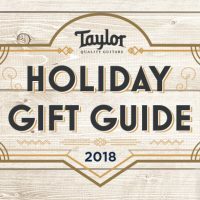 Check out the Taylor Guitars Holiday Gift Guide! A guitar player will tell you: they can never have too many strings or too many picks. We break strings all the time, even if we don’t like to admit it—having a supply of extras at home is a must for any player. We put Elixir strings on all of our guitars, since their coating makes them last longer than traditional strings. 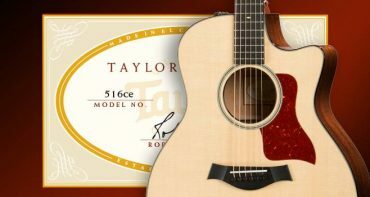 Stock up on picks and guitar strings at the TaylorWare store. 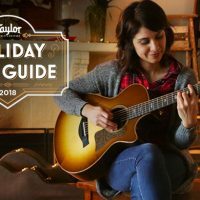 More guitar gift ideas; Clip-on-style tuners have become the gold standard for casual players and pros alike—you’ll see them in basements, garages, recording studios, even attached to guitars played by your favorite musicians on stage. 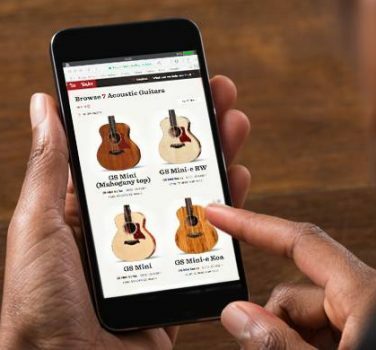 Using the vibration of the guitar to tune instead of a microphone, a clip-on tuner makes it easy to tune up without cables or pedals, even in a noisy environment. Grab a clip-on digital tuner from the TaylorWare store. Guitarists like to have a microfiber polish cloth handy to wipe dust, sweat or spills off of their guitar. 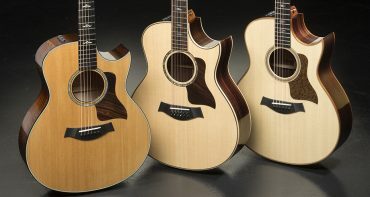 A high-quality guitar polish will keep their guitar shiny and fingerprint-free. Fretboard oil, is also useful for hydrating the fretboard of the guitar, keeping it in good shape while they put miles on the guitar. Add some Taylor flair to your home this season. We stock mugs, pint glasses, practice stools, water bottles, and more—check out the TaylorWare shop for the full lineup. 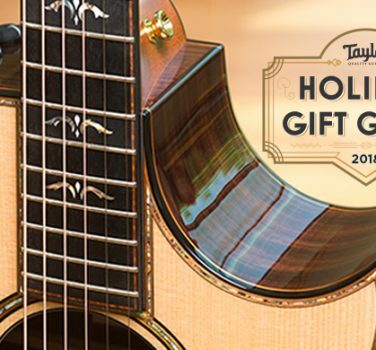 We’re pretty sure that if you buy a Taylor guitar for someone this year, they’re going to love it. So why not help them show off their Taylor pride with a shirt or a cap? We’re stocked up with new designs and options for the holidays seasons, with women’s, men’s, and kid’s sizings available. Head to the TaylorWare store to see the full range! Every guitar player needs somewhere to keep their guitars, whether at home or on stage. A good, sturdy guitar stand can prevent a tragedy like a broken headstock. If you live in a dry climate, we recommend that players keep their guitars in cases so that they don’t dry out and crack. However, if you’re in a humid climate or your gift recipient plays an electric guitar, a wall mount or a stand can be a great way to store and display a cool guitar. Okay, so it’s not exactly guitar-related. As part of the Ebony Project and our sustainability initiatives focused on ebony replanting and cultivation, we’ve designed a set of kitchen products that use ebony from the very same trees that supply fretboards and bridges in acoustic guitars, harvested at our ebony mill in Cameroon, Africa. These cutting boards, produced and sold by our sister company, Stella Falone, feature a cross-grain structure for incredible durability and strength, and their rich, striking grain pattern makes for a truly eye-catching kitchen centerpiece. The best part? No additional trees are cut to produce these boards, and your purchase supports replanting and living wages for local communities around the mill. You can order a Stella Falone cutting board from the Amazon marketplace. This one might seem challenging, but usually, you can get everything a guitarist needs to record their music in one stop at the music store. There are many methods of recording, but if your loved one has a guitar equipped with electronics, it’s as easy as finding a recording interface. These devices connect the guitar to a computer and usually start in the $100 range. Just pick up the appropriate cable when you buy it, and they’ll be immersed in studio magic before you know it. Brands like Focusrite and PreSonus are popular choices. If the guitar player in your life is looking for interesting ways to liven up their practice sessions and experiment with new sounds, a loop pedal can be a great gift idea. Loop pedals, or loop stations, are devices that record and replay short passages of music so the player can layer the sound of the guitar. Companies like BOSS and TC Electronic make loop pedals that are easy to use, with enough recording time and memory slots to please even advanced players. Many musicians use these onstage or as practice tools, but either way, they’re great fun for the guitar geek in your life. 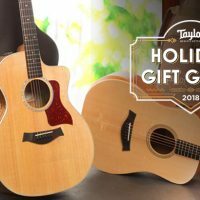 Easiest guitar gift ideas; So you know they want a new guitar, but you don’t know which one to buy. If they’ve been playing for a while, chances are they have something specific in mind. 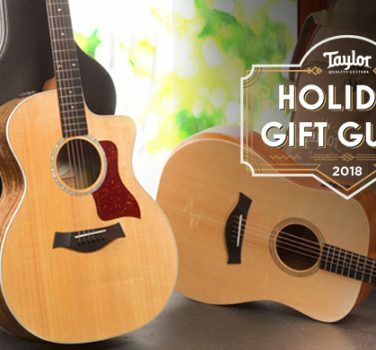 Instead of guessing, why not pick up a gift card to cover the cost of the guitar they really want? 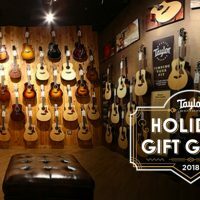 You can even ask your local guitar store for a Taylor guitar shipping box, and wrap up the gift card in that. 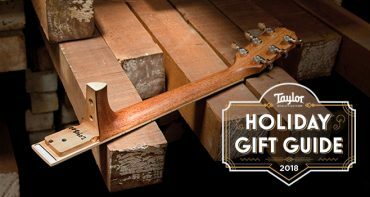 They’ll still get the thrill of unwrapping a gift, and you won’t have to worry about buying the wrong guitar. 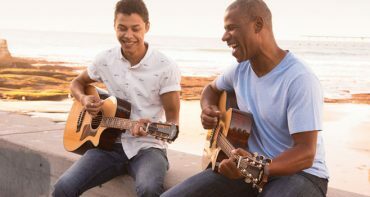 How Much Should I Spend For My First Acoustic Guitar?